145 Kingston Road East, #5. Ajax, ON. 1550 Kingston Road, Pickering, On. 1251 Simcoe Street North, Oshawa, On. Copyright 2010 - 2018. 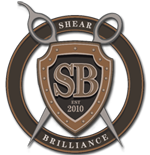 Shear Brilliance Hair Studio. All Rights Reserved.